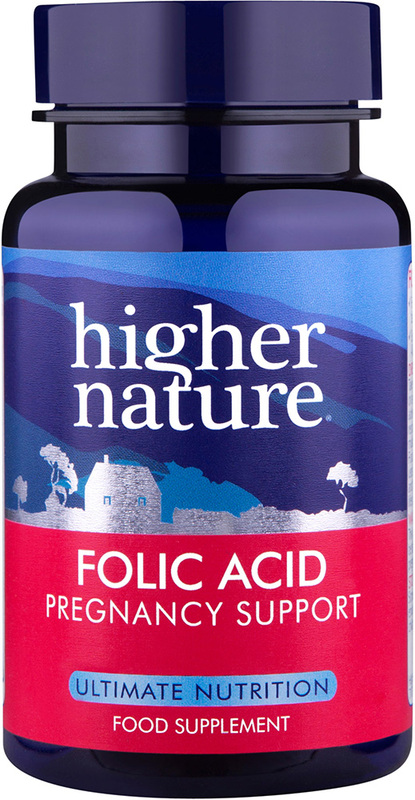 Higher Nature Folic Acid - appropriate for a healthy heart& arteries & an active mind. Important before & during pregnancy & recommended by the Department of Health. There is a serious nutritional deficiency of the vitamin Folic acid in most countries of the world. Before and during pregnancy folic acid is essential to help the normal development of the neural tube (nervous system) in the unborn child and 400µg is recommended by the Department of Health for all pregnant women. The choice of extra Folic acid may also be appropriate for those wishing to maintain a healthy heart and arteries and an active mind throughout the years. Folic acid is one of the key nutrients involved in the methylation pathways which keep homocysteine levels low and is essential for growth and production of red blood cells. It is best taken with Vitamin B12 or a multivitamin. Natural Lithothamnion calcarea, rice flour, zein protein coating, vegetable magnesium stearate, vegetable stearic acid.